So there you are... sitting in your nice little nimble Elise with this HUGE rearview mirror in front of you. 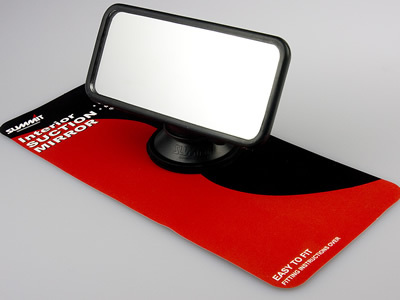 This mirror is equipped with a simple yet effective suction mount. If you clean the windscreen surface before you attach the mirror and use a tiny little bit of soap on the rubber, it will stick for at least a season! The suction mount is a twist type, you press the suction cup on the windscreen so it will stick, then you twist the mechanism which creates a nice vacuum. It sure makes your car look smart! Also, if you are converting a car from RHD to LHD, you will find that the mirror is off set. You should actually take the mirror plinth off and glue it on the windscreen at the LHD location. Nice, but getting the mirror plinth off normally means a broken windscreen! This is the alternative for these converted cars as well!